Copyright 2018 by National Toxics Network. All rights reserved. Marine pollutants are impacting the health of our oceans, their inhabitants and those dependent on oceans for food, culture and their very survival. Everyday an ever-increasing cocktail of intentional and unintentional chemical releases, as well as an unrelenting tidal wave of wastes, particularly plastic waste, enters our waterways and the marine environment. 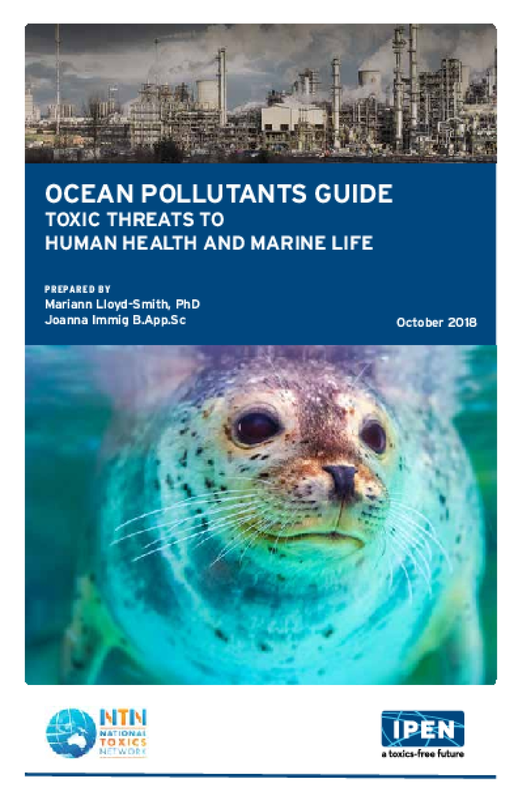 Ocean pollutants include persistent organic pollutants (POPs), endocrine disrupting chemicals (EDCs), mercury and heavy metal compounds, pesticides, pharmaceuticals, oil, plastic wastes and their related chemicals (e.g., BPA, phthalates), personal care products and other industrial and agricultural emissions. We are only just becoming aware of the identity, volume and scope of many ocean pollutants. Their hazards and complex ecological interactions are still unknown. Many ocean pollutants do not have human health data or environmental fate information, and our understanding of the long-term impacts of endocrine disrupting chemicals on the reproduction and behaviour of fish and other marine organisms is still in its infancy. Chemicals enter the marine environment via atmospheric transport, runoff into waterways or by direct disposal into the ocean. It is estimated that 80% of marine chemical pollution originates on land. The vast majority of the global land surface is connected to the marine environment via river systems, so chemical and plastics pollution of rivers is inextricably linked with ocean pollution.